Continuing on with the gift list theme, I thought I would try my hand at shopping for the indie boy. My husband would rather die than consider himself ‘indie’, and has never been too cool for anything, but these are the types of things I would buy to bestow him with a bit more je ne sais quoi when he’s on stage at whichever shady pub that will allow him to emit strange sounds into a microphone. 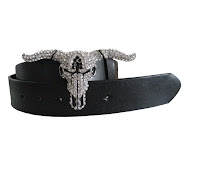 I bought my husband a belt with a bull skull buckle from online accessories store, Jackie Heinsohn. He loves it and gets all the attention he craves when he wears it. Now Jackie Heinsohn carries a new and improved version with added bling. The site is based in the US, but you can pay with paypal, and they will send packages to the UK. And, if you buy it on the 10th of December, you’ll get 10% off. I’ve already done a blog entry on this amazing online record store. So many treasures to buy and share, so many fun facts to know. This site is well worth the visit for any boy or girl. Available at www.anthologyrecordings.com. 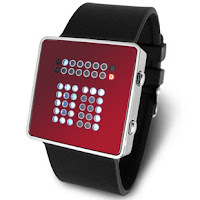 Tokyo Flash sells retro-but-new watches from Japan that tell time in many mysterious ways. The Tibida watch ‘offers three conceptually different ways to tell the time’. Hmmm. I have a hard enough time with dial watches, let alone binary time, but this is just the sort of challenge dorky-but-cool boys love. You can buy directly from Tokyo Flash, or from www.streetfusion.co.uk. These are not sound cancelling, like the flight version, because, well, that would be bad. No matter how rockin’ yer tunes are, you really do need the sound experience interrupted by pesky horns, screams, and screeches, so you know when you’ve almost been hit by a car. That said, the sound quality on these is about 20 times better than the crappy headphones that Apple gives you with your iPod. And, unlike the Apple headphones, they won’t die after 6 months. The Bose headphones come with a set of three different rubber attachments, allowing you to choose just the right size for maximum ear comfort. Available at Bose, Ingram Street, Glasgow.